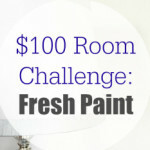 I decided to get some feedback as to which room people wanted to see transformed for this upcoming $100 Room Challenge. I asked on the blog, on Instagram, and on Facebook. 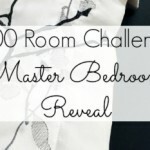 The votes have been tallied, and the Master Bedroom won, so here we go. I recently took this chair out of the office and moved it up to our bedroom. 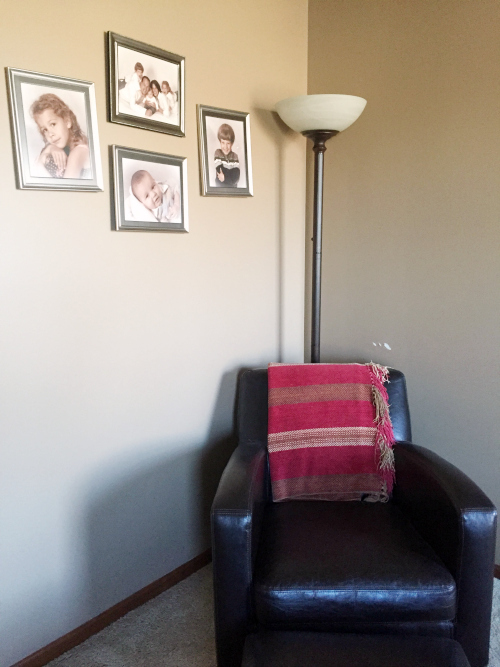 There used to be a glider/rocking chair here, and while it’s still in good shape, it wasn’t the look I wanted in our room. I pulled the blanket from our loft, but it doesn’t match at all. New blanket? Blah. That’s all I can say. 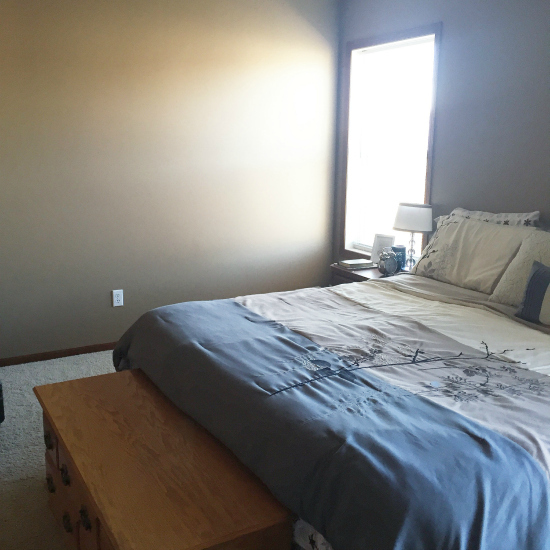 Lauren, over at Bless’er House, did her daughter’s room in Gray Owl so you can see what it looks like. A bit lighter. Were plastic mini-blinds ever in style? I didn’t think so. Here are my two thoughts: 1.) Make my mini-blinds into Roman shades. (I have seen some tutorials on how to do this, but the thought is a little scary.) 2.) Put rods above the windows and get curtains… or use something way cheaper than curtains as my budget is only $100. I’ve seen shower curtains, so maybe I can go that route. Thoughts? 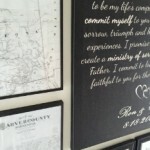 My husband bought me a canvas print of our wedding vows for our anniversary… last August… and for Valentine’s Day this year, I made some printed vintage maps of places that were significant in our lives. Everything is just sitting on the floor in a neat stack waiting for me to do something with it. I think now would be the time. 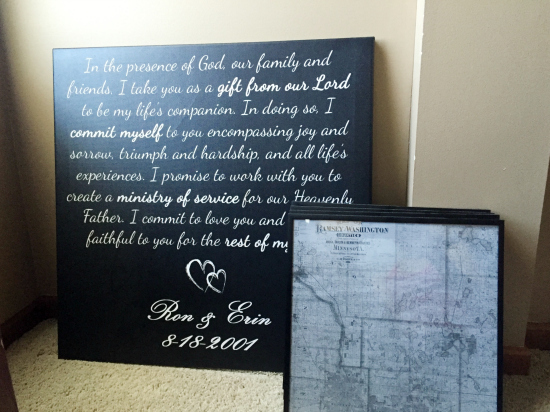 We bought our nightstands when we first got married. We had no money, so we just went with a cheap, dark brown, faux wood nightstand. 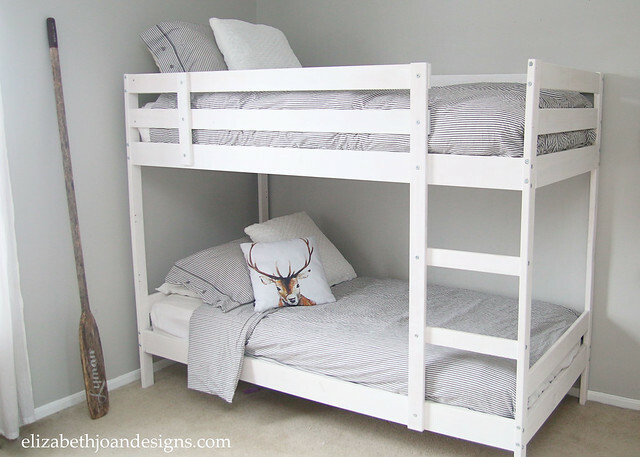 They aren’t my style, and they’re kinda ugly, so if the bed linens don’t work out (please, work out), maybe I’ll grab some paint and hardware, and redo the nightstands. I realize this picture looks like it’s from a fun-house. Our doors really aren’t caving in on the top, but this was the angle I needed to show you what I’m talking about. I am looking for ideas of what to do with this random ledge that runs along this wall. It’s up high… probably gathering a whole lotta dust. Do I just leave it alone? Call it an architectural feature? Or do I do something with it? And if I do something with it, what should I do? I’m pretty excited about this room. Please keep your fingers crossed because there’s a lot to do on a very tight budget. For more inspiration, head over to my “Master Bedroom Inspiration” Pinterest Board. 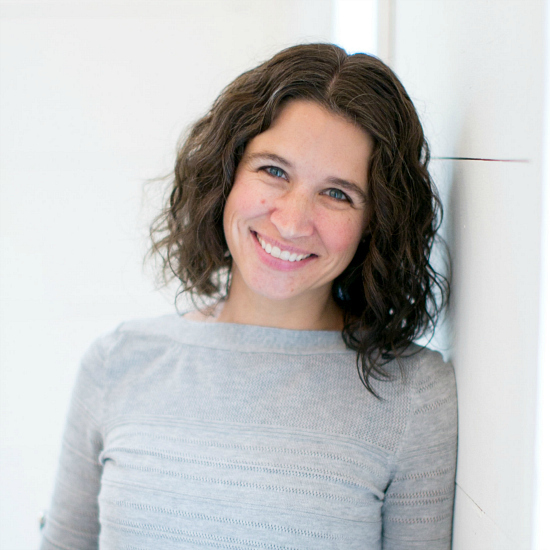 Just found your blog… I am excited about following your make-overs. Here Is an idea – For the empty dust catcher over your door – attach reclaimed wood to it and leave it empty (easier to dust). I’m excited to have you follow along! Love the idea of wood in that space. Are you saying to just attach it to the back wall of the cutout? Thanks for you thoughts. Enjoy your day! I’m not sure how many windows you have or how big they are, but curtains can add so much to a room! I am pretty sure you could find cheap ideas for a unique rod… Good will, or thrift stores and paint it or spray it like you’ve done so many other items in these challenges. And I would maybe look at cloth at a craft store. It’s pretty cheap by the yard, on sale, and you wouldn’t have to buy that much to craftily drape it over a unique rod. You’d have SO much to pick from in colors and patterns. Good news! Found FREE paint… I’m not sure how my local recycle center had the exact paint recommended by my interior design blogging friend, but it did. So, I’ve got a little more money to work with now. Hooray! I completely agree that window treatments are a necessity in this room. I had a high shelf like yours years ago and the budget didn’t allow anything more than cardboard boxes, so that’s what I used! I happened to have leftover wrapping paper that looked like metal. I wrapped the sides of the boxes that showed and “drew” rivets etc on it to look like a metal container and used them to store blankets and holiday supplies. A neighbor loved the idea so much she made “wooden” baskets for her shelf! Love that idea Julie! I’m all about using cardboard in my room makeovers. And we can all use extra storage. I will keep that idea in mind. First of all, I’m impressed that you’re going to try a bedroom makeover on such a limited budget. And I’m a little worried that the entire budget will get eaten up by paint, since it looks like the room is very large. I’ll pass that worry on to you and just offer up some suggestions. 🙂 The gray needs to have warm undertones to work with the existing woodwork and carpet. Both of the grays you picked are very pretty but look cool to me. 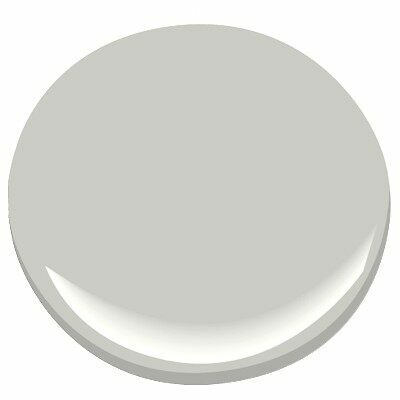 Have you looked at Sherwin-Williams Agreeable Gray? I know you’re trying to get away from anything beige or taupe but I think this shade (or something similar) will work better since you’re not painting the trim. As for the ledge, I’d paint it and leave it alone. Nothing good can come of messing with it. I’ve heard of people using twin bed sheets as curtains–you can find some printed flat sheets for a good price. 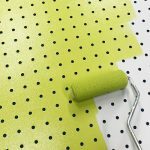 There will probably be better pattern options from sheets than shower curtains. Cheap bedding is tricky–I got nothing! Thank you SO much for a paint option. I always choose grays with blue undertones and I know I need a beige-y undertone instead, but I didn’t even know where to start. I looked at some rooms in “Agreeable Gray” and I love it. My aunt also has “Anew Gray” in her home and that may look good as well. I’ll have to head out to the paint store and get some samples. 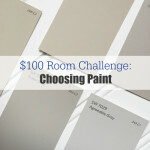 I am anticipating that a huge part of my budget is going to go towards paint, so we’ll see what’s left when that’s done. Honestly, I think a fresh coat of paint is going to do wonders even if that ends up being the majority of my budget. Love the idea of the sheets for curtains too. Thank you, thank you, thank you for all your advice. So glad I have someone who knows something about interior design. Wanna come start your business in MN? 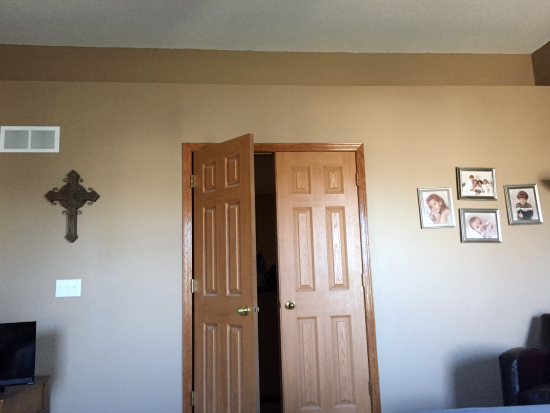 My sister in-law used the Agreeable Gray in her home with similar carpet color and trim and it looks great. I was wondering if you could use the the savings from your coat closet budget for this room or would that be cheating? 🙂 I love following all your makeovers. I went out and bought the same hook at hobby lobby to hang my purse in my mud room. 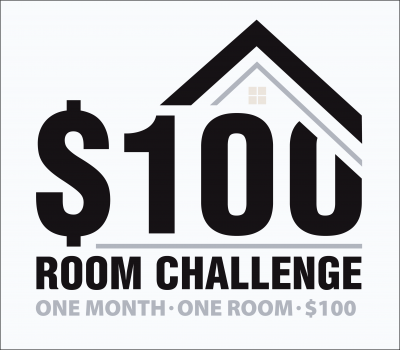 I am so glad you are enjoying the $100 Room Challenges. They have been so fun to do. I love the challenge of working on a small budget and doing as much as I can. AND I am SO glad to hear that Agreeable Gray looks good because, I kid you not, I went to my local recycle center today, and there sat a 5 gallon bucket with the words “Agreeable Gray” written on it. Free paint! Are you kidding me??? There’s only about 1 1/2 to 2 gallons left in the bucket, so I’m hoping that’s enough for the room. But I now have paint for $0. I’m pretty excited! My friend used gray owl in her daughter’s room, and it looks just lovely. I checked the IKEA price for a King Bed and it’s $59.99 here, but so good to know that it holds up well and would be worth the investment. 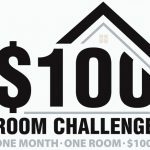 Even if I “can’t” purchase it for this challenge due to the $100 limit, I may go ahead and buy it sometime in the future. Thanks for all your input. So helpful! men and their wood! *hee* my husband would not want me to paint wood, either. lucky for me, the trim in our house was already painted when we moved in (although unlucky for me, it’s mdf, which dents super easily).